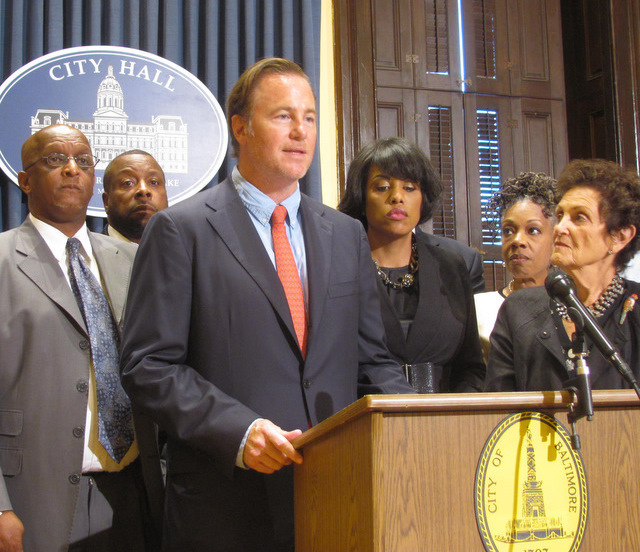 Above: Michael Beatty is flanked by Mayor Stephanie Rawlings-Blake and City Council President Jack Young after the City Council passed special financing for Harbor Point last September. Michael Beatty, the developer of Harbor Point, will invest $46 million, or about one-sixth of the projected cost of the Exelon Tower and related infrastructure. M&T Bank will provide the lion’s share of construction funding ($181 million), while a Wall Street pension trust will hold a 90% equity share in the regional office tower of the energy giant. These details of Harbor Point’s financing and ownership were disclosed at today’s Board of Finance meeting where – as expected – the panel approved $36 million of an expected $107 million in public TIF funding for the project. In a somewhat unusual arrangement, the TIF bonds will be privately placed by the city to entities owned by the Beatty group, which will also act as a “fee developer” of the now-vacant waterfront property. 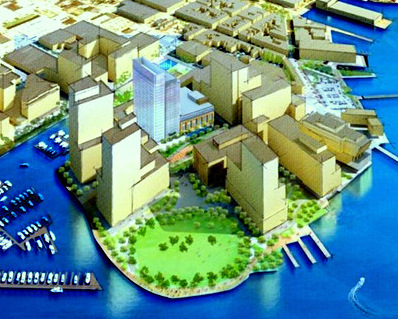 With 3 million square feet of office, retail and residential space, Harbor Point is billed as the biggest private development project in city history. It is expected to take at least 10 years to complete. Environmental concerns about Beatty’s plans to pierce the membrane cap of the site – which entombs hazardous hexavalent chromium from an Allied Chemical factory that once operated there – had delayed groundbreaking for several months. Two weeks ago, the Environmental Protection Agency (EPA) and Maryland Department of Environment approved Beatty’s plan to penetrate the cap to sink about 1,100 pilings for the Exelon Tower. Stephen M. Kraus, chief of treasury management, said M&T Bank signed a letter of commitment to provide $128 million in construction financing for the tower and $41 million for an adjoining parking garage. In addition to buying $36 million in TIF bonds, the Beatty Group will put up $9.8 million for 10% ownership of the Exelon Tower. A pension trust fund administered by J.P. Morgan Chase Bank will take a 90% equity stake in the building in return for an investment of $67.1 million, Kraus told the finance panel today. Kraus also disclosed that the land needed to build the Exelon Tower will cost $26 million, which will bring a hefty payback to Honeywell International, the successor to Allied Chemical, which had been responsible for the cost of clearing up and containing the site’s environmental hazards. Keenan Rice, president of MuniCap, the city’s financial advisor, told the board that the private bond placement will save the city a substantial amount of money. A similar private placement was used to rehabilitate and expand Mondawmin Mall by General Growth Properties several years ago. The arrangement will make Beatty responsible for any shortfalls in the interest to be paid on the bonds – interest that will essentially go back to Beatty through the private placement. The city will divert property taxes gained from the project to a special fund that pays the bond interest. Once the first phase of Harbor Point “stabilizes” with steady income coming from the Exelon complex, the city plans to reissue the TIF bonds on the public market, Kraus said. The board unanimously approved a resolution authorizing the issuance of the $36 million in TIF bonds, with City Comptroller Joan M. Pratt abstaining because she wanted additional information. The measure will now go before the Board of Estimates, where final approval is guaranteed because of the project’s avid support from Mayor Stephanie Rawlings-Blake and City Council President Bernard C. “Jack” Young. Preliminary construction of the Exelon Tower is expected to start by mid to late January. As part of the project, the city will use the TIF funds to build a new bridge to the site along Central Avenue and will erect a public plaza that will showcase the Exelon Tower.